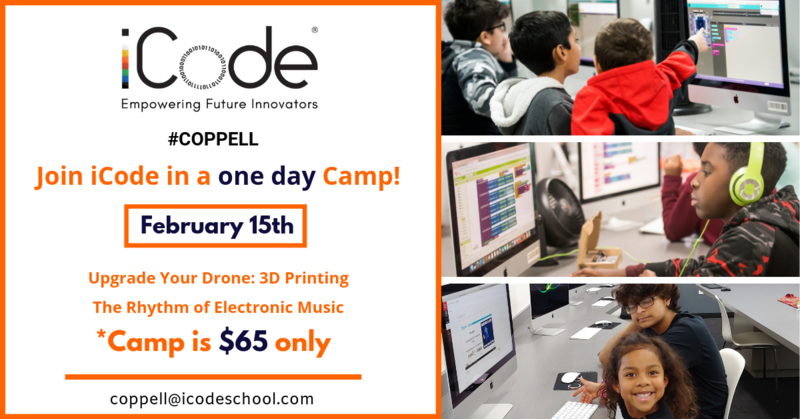 Join iCode for a one-day STEAM camp on Friday, February 15! iCode's day camps provide fun and learning during school breaks. Existing students practice course skills in a collaborative environment, thereby enriching their learning experience. Students who are new to iCode gain an excellent sneak peek into iCode's curriculum. Kids gain exposure to how music works, the basic makeup of music, using Apple Garageband, focusing on the composition of music. This camp is an introduction to composing, arranging, and remixing, allowing students who have no previous knowledge of music theory to use their ears, listening, and discovering music. With GarageBand's midi tracks, there’s a visual representation of how it lines up with the rhythms, not standard notation. The class is relatable to students by introducing them to the basics of music construction through songs they already know. Kids print a series of items, such as a claw used to pick things up, spare propellers and propeller guards, or a camera attachment. Learn about using code to design things for printing.